Our friends at Audified have a great deal for you today. The groundbreaking bundle, STA Effects 2 and the individual STA Preamp 2 plug-in are on promo at 50% off! 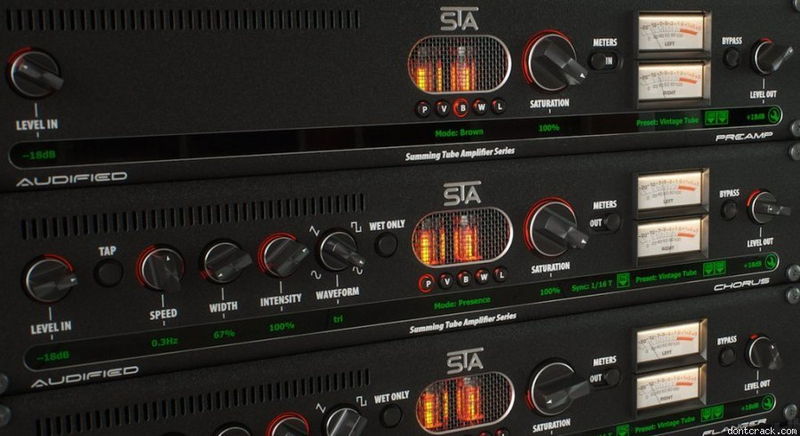 The STA Effects bundle of summing tube processing plug-ins and STA Preamp plug-in both benefit from the STA (Summing Tube Amplifier) technology that uses two signal paths, one is processed by modulation or spectral change and the other is clean. These two signals are mixed on a vacuum tube. That gives “ordinary” effects like Flanger or Phaser, really unique and warm character. The STA Effects bundle is made up of 6 plug-ins, STA Chorus, STA Delay, STA Enhancer, STA Flanger, STA Phaser, and the STA Preamp as well. STA Effects 2 and STA Preamp 2 at 50% off until May 25th 2017, at the DontCrack Store. This entry was posted in DontCrack, Plug-ins, Promotions and tagged Audified, Chorus, Delay, Effects, Enhancer, Flanger, Phaser, Preamp, STA Chorus, STA delay, STA Effects 2, STA enhancer, STA Flanger, STA Phaser, STA preamp, Summing, Tube. Bookmark the permalink.